Back in 60's and 70's, there was an amazing trend of heavy duty eyeliner and kajal. I loved Sharmila Tagore, Rekha, Hema Malini's eye makeup looks. The eyes were so expressive and even until today, the winged eyeliner styles are so popular and trending. For a long time, I wanted to create a Bollywood Retro Eye Makeup and was waiting for some of my hauls to arrive. Now that I finally have them, I decided to do that. It is a very easy look and you can also customize the way you want. 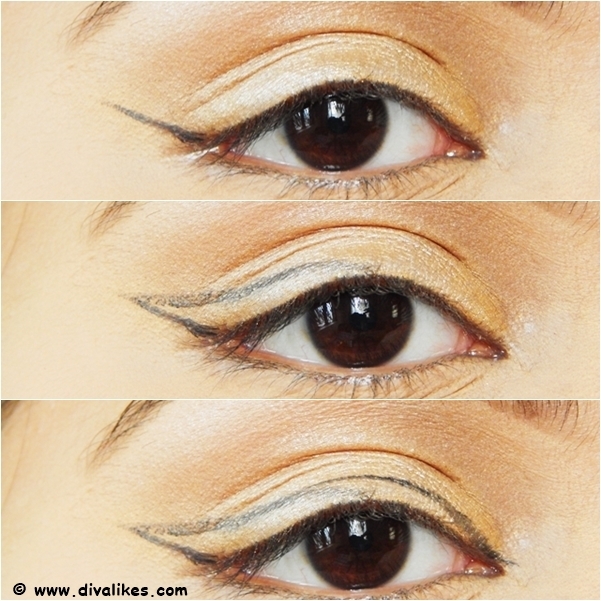 So, scroll down to see how I have created the Bollywood Retro Eye Makeup and also let me know how you liked it. I color corrected the eyelids with NYX Color Correcting Palette (peach color) and applied the Maybelline Fit Me Concealer. I set everything with Bharat & Dorris Loose Powder. I applied the Essence Metal Glam Eyeshadow 07 Golden Up eyeshadow which is a medium golden eyeshadow all over the lid. Next, with the fluffy blending brush it diffused the color and blended it towards the crease. I applied a pale golden highlighter from the Makeup Revolution Highlighter Palette on the brow bone to give it a lift. Next, for the under eyes, I color corrected with NYX Color Correcting Palette (peach and yellow color) and applied the Maybelline Fit Me Concealer to brighten it up. I baked with the Bharat & Dorris Loose Powder. Coming back to the eyelids, I outlined the winged liner which I am going to do. With the help of a thin liner brush and using the Maybelline Eye Studio Lasting Drama Gel Eyeliner, I drew a line from the outer corner towards the end of the brow line. The guide should be the end of your brow. Then, I connected the line with a curve towards the middle of the eyelid. Lastly, I drew an arch along the eyelid. This outline will help you drawing the line with ease. Next, I filled the wing I created with the Maybelline Eye Studio Lasting Drama Gel Eyeliner. Somehow my gel liner was slightly dried up and hence I had to intensify the color further with Lakme Absolute Shine Line Eye Liner Black, which is my current favorite. I lined the lower water line with a white kajal using the Lakme Eyeconic Kajal in White. Ideally, you should use a beige kajal but since I ran out on that, I used a white one. I filled the brow using the NYX Cosmetics Micro Brow Pencil and set the brow with a black mascara. The black isn't usually used but back in 60's and 70's strong brows were done. I also highlighted the inner corner of the eyes slightly. I applied 2-3 thick coats of mascara using the Maybelline Volum' Express The Falsies Mascara after I curled my lashes. I finished off the look applying the gel liner with a soft smudged effect on the lower lash line. And the look is complete. Hope you guys liked the look. Do let me know in the comments below. That winged liner looks so amazing.